Flint Hill is one of the oldest communities in St. Charles County. Originally, it was located on Mexico Road and the Salt River Road, two of the early main roads in the county. Flint Hill was officially founded in 1836 by Captain Taliferro P. Grantham. Captain Grantham purchased 160 acres of land from Benjamin Pierce and then donated 10 acres for the town of Flint Hill. Settlers from Flinthill, Virginia, were moving west in 1833 and came upon this area. It so reminded them of their home in Virginia, that they settled the area and named it Flint Hill after the town they had left. It was not long and they realized the area could produce the crops they were accustom to growing- tobacco. Flint Hill, which was originally considered a rough place to live, was slowly being settled by a prosperous and enterprising group of people. The Flint Hill Post Office was established November 4, 1836, and George Myers was the first postmaster. The first Justice of the Peace was A. Broadhead. Mr. Broadhead’s home is still standing in Flint Hill at 5020 Hwy P.
Flint Hill was originally settled by people of the Methodist faith. Between 1848 and 1855, there were a number of Catholic families in the Flint Hill community. 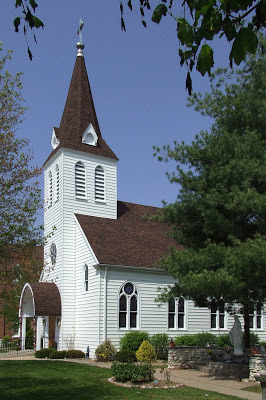 The nearest Catholic congregation was in Josephville and was organized in 1848. As early as 1854, a missionary priest would travel from St. Charles and say Mass in a Methodist home in Flint Hill for area Catholics. The Methodist opened their homes to the priest because their houses were more adaptable for the crowds than the Catholic homes. In the early 1880’s, Reverend Theodore Krainhardt, pastor of St. Joseph’s of Josephville, traveled to Flint Hill to say Sunday Mass for the growing Catholic population. Seeing a need, the first Catholic church in Flint Hill was completed in 1883 and name in honor of Father Theodore Krainhardt. Flint Hill became a tobacco producing community in the early years. Some of the leading tobacco producers had their start in Flint Hill. George S. Myers of Liggett Myers Tobacco Company was born on May 4, 1832, in Flint Hill. His parents and several sisters are buried in a private cemetery on the Rufkahr property on Mexico Road. Between 1860 and 1872, Myers was in partnership with several different people, but in 1873 he went into partnership with John Liggett and Liggett & Myers Tobacco Company was formed. Paul Brown entered the tobacco business in the Flint Hill area in 1868. Due to health problems, Mr. Brown was out of the tobacco business for a few years, but in 1881 the Brown Tobacco Company was incorporated and Paul Brown was elected president. By 1857 Flint Hill was a prosperous and growing town. It boasted many establishments, among them were a fine hotel, three dry goods stores, a saloon, a tailor shop, a tobacco factory, a farm implements factory, a blacksmith shop, and an attorney. There were also numerous medical doctors in the Flint Hill area. The stage coach, carrying both passengers and mail, passed through Flint Hill and terminated at Troy. It was in 1857 that the first train pulled into Wentzville and marked the beginning of the decline of business in Flint Hill. Many factories and businesses slowly moved to Wentzville to be near the railroad station. The property values declined and Dr. Russell Lewis purchased most of the land and rented out the dwellings. The glory days of the 1840’s and 1850’s was slowly passing. Schools have always been an important part of the Flint Hill community. The oldest records date back to a public school operating in Flint Hill in 1880. At that time there was segregation, the white school had a five month term and the black school had a three month term. Many of the family names that are still prominent in the Flint Hill community served as members of the school board during the beginning years: Sachs, Feldewerth, Roettger, Boehmer, Orf. At one time the building that is presently housing Hakenewerth Drywall was a one room public school. 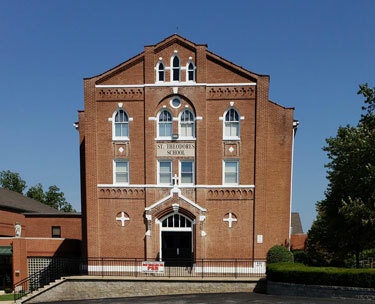 The first Catholic Church, built in 1883 named St. Theodore after Rev. Theodore Krainhardt, was a building roughly 20 by 40 feet and would later be converted into a two room school house for the parish when the new church, presently standing, was built in 1900. St. Theodore School building was brought to the present state with the building of the first section in 1913 and then the addition in 2000.